Neuroblastoma is a cancer that develops in nerve cells. It frequently begins in the adrenal glands; it may also originate in nerve tissue along the spine and show up as masses in the neck, chest, abdomen, or spine. It is the most common cancer in babies and the third most common cancer in children. Ninety percent of neuroblastomas are diagnosed in children age five or younger. 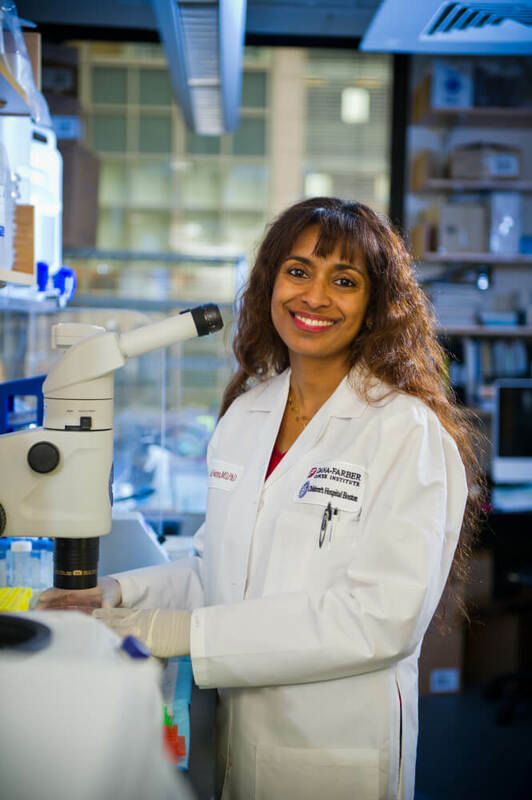 In a small proportion of such individuals who are predisposed to neuroblastoma, the tumor is associated with a variety of rare syndromes that involve other abnormalities, says Rani George, MD, PhD, co-director of the Solid Tumor Program at Dana-Farber/Boston Children’s Cancer and Blood Disorders Center. Examples of syndromes that increase the risk of neuroblastoma are congenital central hypoventilation syndrome (CCHS), Hirschsprung disease, ROHHAD (rapid-onset obesity, hypothalamic dysfunction, hypoventilation, and autonomic dysfunction) syndrome, Costello syndrome, Noonan syndrome, and Beckwith-Wiedemann syndrome. Occasionally, neuroblastoma is seen in patients with cancer predisposition syndromes such as Li-Fraumeni syndrome. In most hereditary cases of neuroblastoma, the tumors develop at an earlier age and may occur in several parts of the body. In recent years, scientists have identified two specific genes, ALK and PHOX2B, that are most often mutated in hereditary neuroblastoma. Both genes govern the growth and division of nerve cells, and normally an individual has two working copies of the gene. When one copy is altered or mutated, it increases the risk of neuroblastoma. Other gene mutations that can cause neuroblastoma include TP53, BRCA1, and BRCA2. When a child has been diagnosed with a syndrome predisposing them to neuroblastoma, or when they have been found to carry one of the gene mutations that can cause the cancer, experts recommend screening to detect any tumor as early as possible. In 2017, the American Association for Cancer Research (AACR) issued consensus recommendations resulting from a Childhood Cancer Predisposition Workshop; the first author is Junne Kamihara, MD, PhD, a physician in the solid tumor center at Dana-Farber/Boston Children’s who focuses on pediatric cancer predisposition syndromes. The report recommends surveillance for individuals with inherited ALK or PHOX2B mutations, and in addition for individuals with TP53 mutations, Beckwith-Weideman syndrome with CDKN1C mutations, Costello syndrome with HRAS mutations and those with a strong family history of neuroblastoma or neuroblastoma that occurs multifocally—or arises at different sites of the body at the same time. Initiation of frequent screening exams in a child as soon as a neuroblastoma gene mutation is identified, up to age six, followed by less-frequent exams until age 10. After that, no exams are needed. The screening tests include an abdominal ultrasound exam, a urine test (certain chemicals may be higher in individuals with neuroblastoma), and a chest X-ray. Continued research that increases our understanding of neuroblastoma may lead to modifications of these surveillance recommendations.